I was getting ready to run the Warrior Challenge as part of Williamsburg, VA’s Run for the Dream weekend festivities which included running a 5k Friday evening, 8k Saturday morning, and a half marathon Sunday morning when oh Captain our Captain gave me my first ever Shenanigan challenge – to find a celebrity! OMG how cool would that be to find a celebrity and get a selfie with them! I was totally down and couldn’t wait to get running! The 5k was miserable and hot but I did find this cutie and thought surely she has to be in movies or on the latest Disney channel show! During the 8k i was totally on the lookout for any celebrity to complete my Shenanigan Challenge! We ran through the most beautiful parts of Historical Williamsburg but it wasn’t until the end when I found this kid who must be an Angel sent to give me my medal! Of course you can’t deny the celebrity status on this guy! The Myth The Legend The Chick Fil A Cow! Still not sure I had found the celebrity I was tasked to find to complete my Shenanigan Challenge, I sought the advice of our Forefathers before stuffing my face at Dog Street Pub. He assured me the half would be awesome and I would find my Celebrity! So morning of the half I was confident I would find the ultimate celebrity and I had my posse ready to help me complete my Shenanigan Challenge! It didn’t take long for some of my posse to start questioning whether I could do this.. It is only mile 2 boys! We did run into our favorite Disney Girl Meghan and stopped to have some drinks – I think the bartender was famous…oh wait no that is just No Facebook Having Steve! Alas it was the end of the race and I didn’t meet anyone I thought qualified as a celebrity. Before I got too broken up about it I realized I did take a selfie with a celebrity – ME! I am Brittany Bear-Brown AKA Queen B! And I had multiple medals – Holla!! Shenanigan Challenge: COMPLETE. Warrior Challenge and Half Marathon medals! This Shenanigan Challenge was SO much fun! 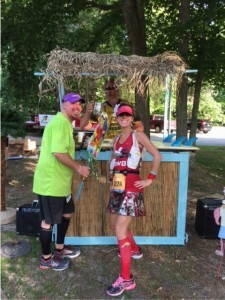 That is what Shenanigans is all about – putting the fun in your run and it is so much more fun when you can enjoy a race with good friends and good beer! Cheers! Onto the Next Challenge! !